How do we define SDE Connection for workspace in Python Scripting? >>> arcpy.env.workspace = "C:\\Users\\chad\\AppData\\Roaming\\ESRI\\Desktop10.0\\ArcCatalog\\anrc_water (anrcuser).sde"
Here is a simplified version I made that lets me do on the fly connections in python using Sql Server direct connect only. 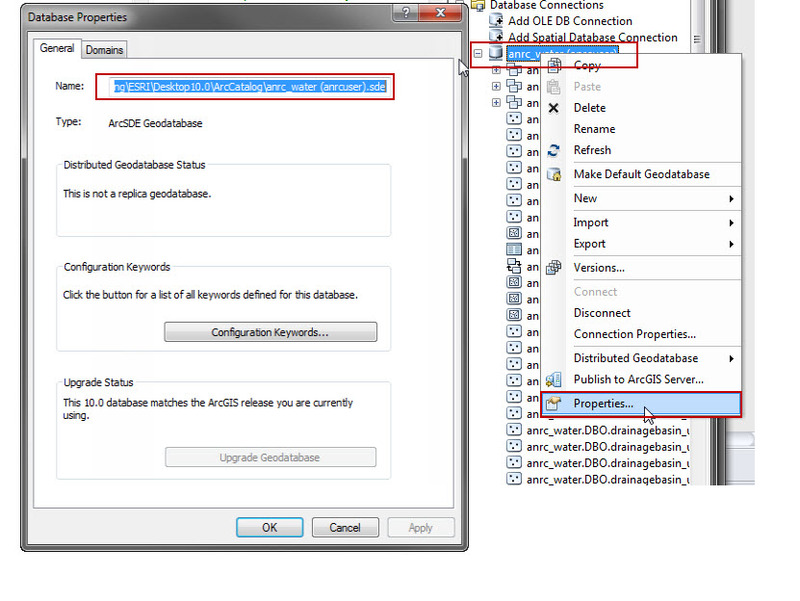 Connection_File_Name = temp + os.sep + Conn_File_NameT + ".sde"
print "\nCreating ArcSDE Connection File...\n"
This eliminates the problem of database connection files being inconsistent from machine to machine or user profile to user profile. TCA_Connection = "prod_sde.sde\\prod_SDE.GIS.PropertyTax" + CAPSYear + "\\prod_SDE.GIS.Tca"
This will set your path to where your .SDE file lives, but then you set the path inside that connection to the layer you are looking for. In my case I also set a Year variable. you can also define the path of connection directly in your Query . and use it in Search and etc. Not the answer you're looking for? Browse other questions tagged python enterprise-geodatabase or ask your own question. How does one access a featurelayer in SDE via Python? Editing ArcFM ArcSDE table in version with ArcPy? Extract an ArcSDE datasets (rasters/shapefiles) using Python? How to hide system tables of oracle in sde connection? Opening ArcSDE connection file ( .sde ) & checking syntax? Reading .sde connection file without Esri softwares?